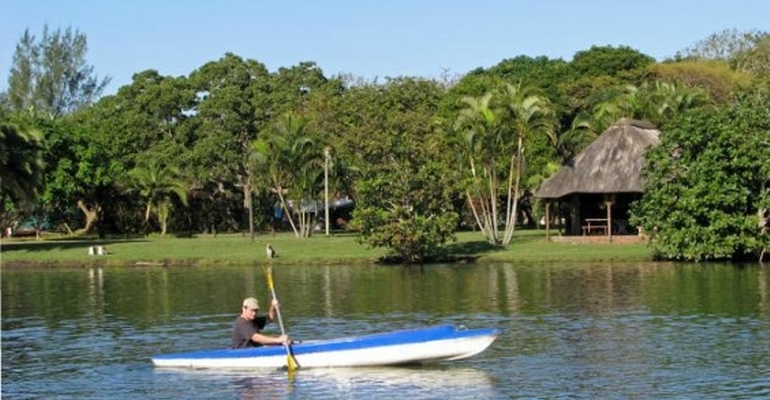 Umtentweni Caravan Resort is a small, quiet, attractive park with exceptionally high standards. The resort is ideally situated on the banks of the Mtentweni Lagoon which is perfect for fishing, canoeing or windsurfing. A beautiful shark protected beach is only 600m away. Besides the campsites, there are also two self catering chalets and caravans for hire. The chalets and caravans are all fully equipped with the necessary utensils and are well maintained. Recreational facilities in the resort include children’s play park, a trampoline, swimming pool, organised events during season and a large open grassed area on the banks of the lagoon, perfect for sports, games and recreation. There is also a pool table, table tennis, volleyball, darts, games room, TV room with DSTV. Communal braai for organised braai's. Canoes are available and there is fishing in both river and sea. Let’s not forget our on-site pub, the Sharks Cove, which is located under a thatch roof on the river bank. Plenty of activities such as darts, table tennis, volley ball, canoeing etc. Please contact us for additional information such as rates, rules etc.